3H is a learning strategy. After students have been taught how to use them, learning strategies are to be used by students independently. Use explicit instruction (explanation, modeling, guided practice, independent practice) to teach this strategy. Explain why students should learn this strategy. Using the 3H poster, explain each type of question. “Here” refers to answers that are found in the text directly “on the lines.” These answers are typically found in one place. 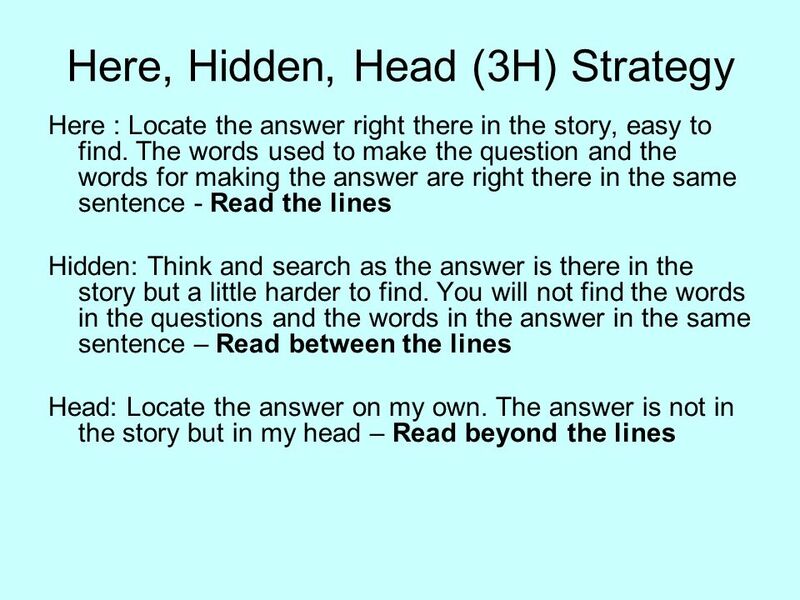 “Hidden” refers to answers that are found “between the lines.” These answers can be found by joining together information that is found in different places in the text. “In My Head” refers to answers that are found “beyond the lines.” These answers come from background knowledge or may involve opinions or what a reader thinks. Give an example of each type of question from a current movie or fairy tale students are familiar with or use relevant examples from the school’s culture. Guided practice: Guide students in performing the strategy in small groups or in pairs. If students need additional support, they can orally recite the description of the three H’s or use notecards with a description written on them. Monitor student progress. During this time, scaffold the learning and support students who need assistance in using the strategy. They can also model the think aloud strategy (when in pairs) to strengthen comprehension and learning of the steps involved. Independent practice: After guided practice, students should only use the strategy independently, once they have shown they have mastered the strategy. Students can also be given the opportunity to reflect on the strategy. Graham, L., & Wong, B. Y. (1993). Comparing two modes of teaching a question-answering strategy for enhancing reading comprehension didactic and self-instructional training. Journal of Learning Disabilities, 26(4), 270-279.